"Turkish competition is increasingly tougher for Spanish grapefruit"
The Spanish grapefruit season has already passed its peak, since between 65 and 70% of the production has already been harvested. Prices have not been high, despite the decline in the production, which ranges between 15 and 20%, depending on the production area, explains Mª Dolores Pelegrín, manager of Apemar. "Grapefruit sales are a bit slow and prices are relatively low, but we hope to finish the season well, selling all the fruit we have purchased from the producers we work with," says the exporter. Mª Dolores Pelegrín pointed out that one of the reasons for this slow demand is the slight reduction in the sizes this year, but above all, the growing competition from Turkish grapefruit." "Turkey is managing to extend its grapefruit campaigns more and more, supplying more volumes at considerably lower prices to more and more European destinations. We are feeling the impact of its growing competition in markets such as France, Italy, Poland and other Eastern European countries." 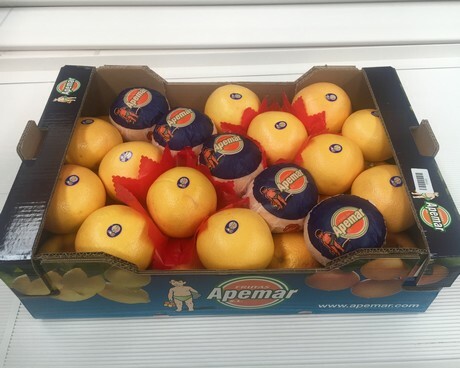 The Murcian company sells lemon and grapefruit 365 days a year, as it has access to both Spanish fruit and imports of South African grapefruit during the off-season, whose quality is said to be just as high as that of the Spanish. When the Spanish lemon season ends, imports arrive from Argentina, Chile, South Africa and Uruguay. "As a family business, we have been specialists in grapefruit since the 1950's, when my father decided to bet on this crop, which at that time was unusual. We market between 8 and 9 million kilos of grapefruit a year, although in the past, we handled an even greater volume, since we didn't have as many competitors," explains María Dolores Pelegrín. The most common grapefruit variety for Apemar is the red Star Rubi, and to a lesser extent, the Rio Red. It also has white grapefruit, a product that is increasingly difficult to find in the main Spanish production areas. The grapefruit of this Murcian company is sold in Spain's main wholesale markets, as well as in large distribution chains. At the same time, there are exports going to destinations such as France, Belgium, Italy, the United Kingdom, Norway, Poland, the Eastern countries, Dubai, the Asian countries, Canada, Brazil, etc.